Institute of Psychology, Psychological Sciences, University of Liverpool, Liverpool. Primary Care Clinical Sciences, University of Birmingham, Birmingham. Background Guidelines suggest that GPs should intervene on patients’ weight, but to do so GPs must first recognise that a patient may have a weight problem and weigh them. Aim To examine whether GPs and trainee GPs can identify overweight and obese body weights by sight, and if this influences whether they would discuss weight with a potential patient. Design and setting Study of GPs and trainee GPs on the lists of the UK NHS Workforce West Midlands Deanery and NHS Sandwell and West Birmingham Clinical Commissioning Group. Method Participants viewed 15 standardised photographs of healthy-weight, overweight, and obese young males, and estimated their BMI, classified their weight status, and reported whether they would be likely to make a brief intervention for weight loss with that person. Results The sample of GPs and trainee GPs correctly classified a mean of 4.0/5.0 of the healthy weight males, a mean of 2.4/5.0 of the overweight, and a mean of 1.7/5.0 of the obese males. For each 1 kg/m2 increase in actual BMI, participants underestimated BMI by −0.21 (95% CI = −0.22 to −0.18), meaning that participants would underestimate the BMI of a man of 30 kg/m2 by approximately 2.5 kg/m2, but were more accurate for lower body weights. Participants were more likely to intervene with those with a higher estimated BMI (OR 1.53, 95% CI = 1.49 to 1.58). Conclusion This sample of predominantly trainee GPs perceived overweight and obese weights as being of lower BMI and weight status than they actually are, and this was associated with a lower intention of discussing weight management with a potential patient. This was found to be true for trainee and fully qualified GPs who participated in the study. Healthcare professionals should not rely on visual judgements when identifying patients who may benefit from weight management treatment. Obesity affects a large proportion of Western populations and US and UK national guidelines suggest that healthcare professionals should screen and offer help to overweight and obese patients to lose weight.1,2 Despite this, such discussions are uncommon in practice.3,4 One reason for doctors’ lack of intervention on weight could be that they fail to recognise a person as obese. The pay-for-performance scheme (Quality and Outcomes Framework [QOF]) for UK GPs rewards doctors for having an obesity register including a weight recorded in the last 15 months, and NHS guidelines encourage primary care doctors to address weight management with their overweight and obese patients.2 Although most of the population visit their GP annually,5 the prevalence of recorded obesity using this electronic register is approximately 10%,6 whereas the true prevalence is close to 25%.6 A physician has to raise the topic of weight in the first place to record a weight and this conversation is initiated presumably mostly on visual perception. A substantial proportion of parents of obese children underestimate their child’s weight status,7,8 and healthcare professionals may be no more accurate than the general population at estimating children’s and adults’ weight status. The present study examined whether GPs and trainee GPs could correctly recognise healthy-weight, overweight, and obese males, and whether they would consider intervening with such patients. The aim was to examine the extent to which visual perception can impact on GPs’ propensity to treat obesity. GPs’ perceptions of who is responsible for treatment of obesity, and how conscious they were of their own weight, were also measured, to examine if these attitudinal measures also predicted hypothetical propensity to offer treatment. Between April and May 2013, 2055 GPs and trainee GPs on the lists of the UK NHS Workforce West Midlands Deanery and NHS Sandwell and West Birmingham Clinical Commissioning Group were emailed. The email described the study as examining GPs’ perceptions of body weight. A required sample size for the study was not formally calculated, although the aim was for a minimum n = 100. There is much emphasis on the role of GPs and other healthcare professionals in tackling the obesity epidemic. Although clinical guidelines advise doctors to raise the issue of weight management with their overweight and obese patients, this rarely happens and most cases of obesity are not recorded by GPs, which impacts greatly on treatment likelihood. Here, a potential explanation for this is tested: healthcare professionals do not know what unhealthy weight statuses look like and are unable to identify obesity. The findings of this study of primary care doctors and trainee primary care doctors are that most underestimate the weight status of overweight and obese males. Moreover, underestimation of weight status was associated with doctors and trainees reporting that they would be unlikely to discuss weight management with that person, suggesting that visual underestimation of body weight could impede obesity intervention efforts in primary care. Participants rated 15 photographed white British males aged between 18–30 years old. The photographs were evenly split between healthy-weight, overweight, and obese individuals (that is, five of each category). The healthy-weight models’ BMI ranged from 19.4 to 22.4 kg/m2, overweight models from 25.6 to 28.3 kg/m2, and the obese models from 30.5 to 34.4 kg/m2. Models wore normal-fitting, short-sleeved shirts and trousers and were photographed standing both front- and side-on with their arms at their sides and next to a standard sized door. Males who participated in strength-building sports were excluded from the stimulus set. An earlier pilot study had been conducted with 50 participants who rated the initial stimulus set on a number of scales including age, attractiveness, height, how muscular they appeared, and tightness of clothing (for example, how attractive is this man? ), to select healthy-weight, overweight, and obese photograph sets matched for these variables. The central section of each model’s face was obscured with a black square to control for facial expressions and preserve anonymity. On accessing the study website, participants provided demographic information, years of experience, height, and weight. To measure GPs’ feelings of responsibility to treat obesity, participants rated their agreement with ‘as a GP, you have a responsibility to ensure your patients are a healthy weight’, and ‘weight management is primarily a concern of the patient’. To measure how conscious GPs were of their own weight, they rated agreement with ‘I know I should be a healthier weight’ and ‘I am conscious about my weight’. These questions were recorded using 5-point Likert scales (strongly disagree to strongly agree). Participants were then informed that they would be categorising photographs of males as being underweight, healthy weight, overweight, or obese, and they should do this according to the World Health Organization body mass index (BMI) guidelines, which were shown. The BMI categories presented were underweight <18.5 kg/m2, healthy weight 18.5–24.9 kg/m2, overweight 25.0–29.9 kg/m2, and obese ≥30.0 kg/m2. Participants were then told they would see 15 photographs in random order. They were not informed or aware of the number of photographs from each weight category. Participants were shown each of the 15 photographs and underneath each one they were asked to categorise the model into one of the four weight categories, estimate BMI, and select a response to ‘If I were this person’s GP, I would discuss their weight with them’ (using the same Likert scale). Participants were provided with feedback about their performance on the task and were debriefed about the aims and expected findings of the study. Do GPs accurately perceive weight status and does model weight status influence this? The average number of photographs GPs correctly allocated to BMI category was calculated. Fifteen random guesses would categorise 3.75 photographs correctly on average. It was therefore calculated whether GPs were better than chance by a one-sample t-test with a test value of 3.75. For each GP, the number of photographs correctly allocated to the healthy-weight, overweight, and obese categories were calculated. The mean number correctly classified was compared across the three BMI categories using repeated-measures ANOVA (with weight status of photographed males as a factor with three levels) and planned Bonferroni corrected t-tests to follow-up a main effect. GPs were also asked to estimate the BMI of the photographs, and variation in the accuracy of these estimates was examined according to the actual BMI. As there was very high concordance between BMI estimates and assigned weight status category, the BMI estimation data were used to examine whether there was a tendency to underestimate weight and if this tendency was related to the size of the photographed males. For each photograph, the error was measured (estimate minus the true BMI). Then, for each GP, a regression coefficient for the slope of this error line and the intercept was estimated. The mean intercept and mean slope for all GPs was estimated and the difference from zero using a one-sample t-test was tested. For these analyses, BMI was centred at the lowest true BMI. What predicts whether GPs report they would be likely to talk to overweight and obese males about their weight? Factor analysis showed that both measures of GPs’ weight consciousness and sense of responsibility to intervene with patients loaded onto two separate factors. The mean of each of the two questions was taken, therefore, to form single-item measures for the two constructs (weight consciousness and feelings of responsibility for weight management), reverse scoring as appropriate. A multilevel binary logistic regression model was used to estimate the likelihood of a GP intervening with a particular ‘patient’. The outcome variable was binary, indicating whether the GP strongly agreed or agreed that they would be likely to intervene (intervention), or zero if they were unsure, disagreed, or strongly disagreed (an ordinal logistic regression model would not converge on a solution). Estimated BMI was added in one step, then GP responsibility and GP weight consciousness in a second, and finally the interaction between them. The first model tested whether GPs were more likely to intervene, the higher the estimated BMI. The second model accounted for estimated BMI and also examined whether GPs who feel more responsible for helping patients intended to intervene more often and whether GPs who felt conscious about their own weight were less likely to intervene. An interaction term in the second model allowed for testing of whether GPs who felt responsible were inhibited from intervening because they were conscious about their own weight. Three-hundred and fifteen GPs participated with a mean age of 33.9 years (SD 8.3) and mean BMI of 24.0 kg/m2 (SD 4.7). Of these, 109 (35%) were male and 248 were GPs in training. Of the GPs in training, 38% were in their first year, 29% were in their second year, and 30% were in their third year of training (a minority did not report this information). Thus, most participants were trainee GPs and tended to be female. On average, GPs correctly categorised 8.0/15 photographs into the correct BMI category. This score was significantly above chance expectation (P<0.001). GPs were more accurate when classifying healthy-weight photographs than overweight or obese. They classified 4.0/5.0 healthy-weight, 2.4/5.0 overweight, and 1.7/5.0 obese photographs correctly (F(1,314) = 615.2, P<0.001, ηp2 = 0.66, P<0.001 for each between category contrast). As some of these data were not normally distributed, equivalent non-parametric analyses were also conducted and the same pattern of significant differences is observed as when using ANOVA. It was also investigated whether the accuracy of estimated BMI was associated with true BMI. The mean and SD of the intercept was −0.19 kg/m2 (1.40) with 95% CI = −0.34 to −0.03, P = 0.02, which means that at a BMI of 19.38 kg/m2, the lowest true BMI of the photographs, GPs estimated the BMI to be 19.19 kg/m2 (0.19 kg/m2 lower). On average too, GPs underestimated BMI with increasing true BMI. The mean and SD of the slope for GPs was −0.21 (0.18), with 95% CI = −0.22 to −0.19, P<0.001, meaning that on average, GPs would underestimate the BMI of someone with a BMI of 30.0 kg/m2 as being 27.58 kg/m2 (Figure 1 illustrates actual and estimated BMI of each photograph). BMI estimates for photographed models. GPs varied greatly on whether they would be likely to intervene on weight. Using the random effects model, the average rate of reporting a likelihood of offering intervention was 29% (across all photographs), with GPs one standard deviation away from the mean intervening in 16% and 72% of photographs, respectively. As expected, GPs were more likely to intervene the higher they estimated the photo’s BMI, with an OR of 1.53 (95% CI = 1.49 to 1.58) per 1.0 kg/m2 increase in estimated BMI. Neither feeling responsible for weight management nor GPs’ weight consciousness were significant in the model separately or together (Table 1). The interaction between feeling responsible and being weight conscious was not significant when added to Model 2 (P = 0.084). As GP’s own BMI could affect likelihood of intervention in a way that would not be reflected in weight consciousness (for example, heavier GPs may have a lack of belief in their ability to manage weight), addition analysis was run to test whether GPs’ own weight (as a continuous variable in a model also including estimated BMI) predicted intervention, and the two were not associated. Qualified (n = 67) and trainee (n = 248) GPs tended to underestimate the weight status of the photographed males. There was some evidence that qualified GPs were slightly more accurate at categorising the photographed males than the trainees, but this difference was small. On average, qualified GPs correctly identified the weight status of 9.0 (2.6) of the 15 males, whereas trainees identified 7.8 (2.5) and this difference was statistically significant (P<0.05). Table 2 shows the qualified and trainee GP performance for the three weight status categories. The tendency to underestimate BMI with increasing true BMI of the photographs was similar for trainees and qualified GPs, with no difference between the size of slopes for the two groups (P = 0.12). Thus, both groups tended to miscategorise weight status of the photographed participants because of underestimation, and this tendency increased with the weight of the photographed males for trainee and qualified GPs. The use of a tightly controlled experimental design is a strength of the present work. GPs only rated photographs of young males and there are no data on what their accuracy would have been if the models had been older or female. The BMI of the photographs ranged from 19.4 to 34.4 kg/m2. This is a limitation as, in the UK, a significant proportion of obese people have a BMI >35.0 kg/m2 and, presumably, GPs will more easily identify BMIs above this as obese. The experimental paradigm meant that it was possible to reduce the potential role of other variables, such as dress or stance, as explanations of GPs’ accuracy. This experiment may overestimate the ability of GPs to identify obesity in practice. The models stood front-on and side-on in light clothing and GPs were asked to concentrate on this task. In reality, GPs consulting patients in the UK will tend to be faced with a person sitting wearing several layers of clothing and recognition of obesity will not be foremost in a GP’s mind. There was a relatively low response rate from recruitment (15%). It may be that the participants who responded to recruitment in this study were particularly interested in obesity, and their performance may or may not be representative of other GPs. Future work must validate the findings shown here in real-life consultation settings with actual patients, as the present work relied on self-report experimental data outside of usual care. A previous study showed GPs line drawings of different body sizes and found that heavier GPs reported being less likely to intervene for obese body sizes; this may have been because they felt conscious about their weight and believed that patients would not trust their advice.11 The present study measured how conscious GPs and trainees were of their own weight to test if this predicted intervention, but found it had no significant effect. Although there was a great deal of variability in propensity to intervene in the present and the previous studies, there are some differences. The previous study sampled US GPs and did not use actual images of overweight and obese people. The present study also tested whether GPs’ perceptions of who is responsible for the treatment of obesity predicted reporting likelihood of offering treatment. Unlike a number of qualitative studies that have suggested personal beliefs about responsibility for treatment may influence whether or not GPs treat obesity,9,14 here this was found to have little effect. One variable not considered that could explain propensity to intervene is self-efficacy regarding treatment effectiveness. Previous research has shown that relatively few GPs feel as though they have received adequate training to treat obesity.15 A lack of belief in one’s ability to promote positive change may prevent treatment, even if obesity has been recognised. Most participants in this study were GPs in training. Some evidence was found that the more experienced qualified GPs were slightly more accurate at estimating weight status. This difference was small, however, and there was a tendency to underestimate weight across both the experienced and lesser experienced GPs in this sample. Given that trainee GPs will play a role in future public health weight-management efforts, understanding their perceptions of obesity and intervention is of importance. It is not usual to think of estimating BMI by sight as a core clinical skill. It is, after all, accurately assessed by weight and height measurement, which takes less than a minute. For GPs to do this, however, they have to start talking to the patient about weight, and assessing that they may have a significant weight problem is an important cue for that discussion. The present work suggests that a sample of predominantly trainee GPs had poor visual perception of weight status and underestimated weight of overweight and obese males. This was also true for the fully-qualified GPs who participated in the study. It is important that healthcare professionals do not rely solely on visual judgements when identifying patients who may benefit from weight management treatment. We would like to thank Richard Stevens for advice on the analysis methods used. This research received no external funding, however Helen Parretti's post is funded by Health Education West Midlands and the Primary Care Research Trust, and both Paul Aveyard and Eric Robinson are funded by the UK Centre for Tobacco and Alcohol Studies. The study was granted ethical approval by the University of Liverpool research ethics committee and participants provided informed consent prior to taking part. Revision requested June 6, 2014. (1998) Clinical guidelines on the identification, evaluation, and treatment of overweight and obesity in adults: the evidence report (National Heart, Lung, and Blood Institute, Bethesda, MD) NHLBI Obesity Education Initiative Expert Panel on the Identification, Evaluation, and Treatment of Obesity in Adults (US). (2006) Obesity: guidance on the prevention, identification, assessment and management of overweight and obesity in adults and children (NICE, London) Nice guidelines (CG43), https://www.nice.org.uk/Guidance/CG43/chapter/guidance (accessed 21 Sep 2014). (1999) Are health care professionals advising obese patients to lose weight? JAMA 282(16):1576–1578. (2007) Talking to primary care patients about weight: A study of GPs and practice nurses in the UK. Psychol Health Med 12(5):521–525. GP patient survey 2012/2013, http://www.england.nhs.uk/statistics/2013/06/13/2012-13-gp-patient-survey-aggregated-wave-1-and-2-results/ (accessed 11 Sep 2014). Statistics on obesity, physical activity and diet: England 2014, http://www.hscic.gov.uk/catalogue/PUB13648/Obes-phys-acti-diet-eng-2014-rep.pdf (accessed 29 Sep 2014). (2011) Parental perceptions of weight status in children: the Gateshead Millennium Study. Int J Obesity 35(7):953–962. (2011) Parental misperception of their child’s weight status: clinical implications for obesity prevention and control. Obesity 19(12):2293. (2005) A qualitative study of GPs’ views of treating obesity. Br J Gen Pract 55(519):750–754. (2008) Beliefs about the causes and solutions to obesity: a comparison of GPs and lay people. Patient Educ Couns 71(1):72–78. 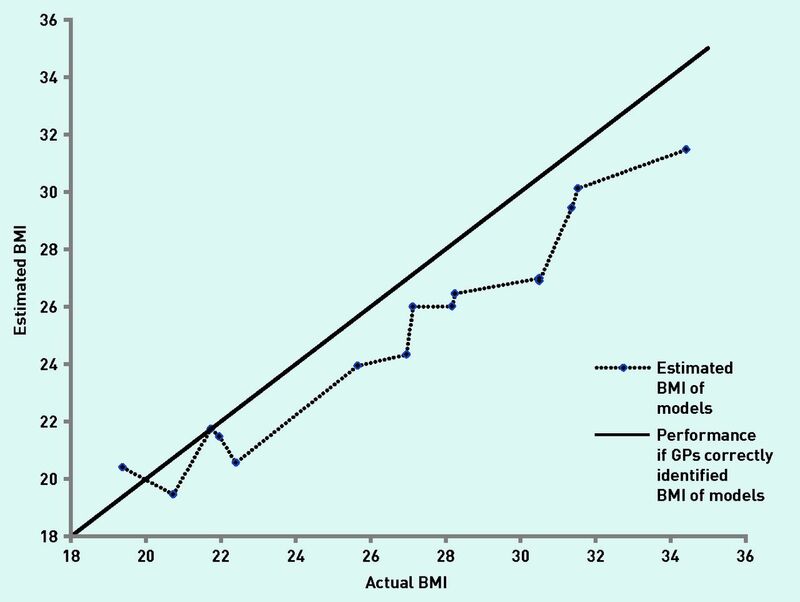 (2012) Impact of physician BMI on obesity care and beliefs. Obesity 20(5):999–1005. (2012) Accuracy of visual estimation in diagnosing obese individuals — a blinded study. BJMP 5(2):a520. (2014) Is he a healthy weight? Exposure to obesity changes perception of the weight status of others. Int J Obes (Lond) 38(5):663–667. (2007) Obesity counseling and guidelines in primary care: a qualitative study. Am J Prev Med 32(4):334–339. (1997) Physician attitudes toward managing obesity. Prev Med 26(4):542–549.